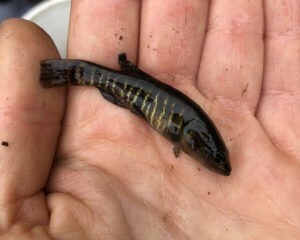 The Olympic mudminnow (Novumbra hubbsi) is a fish found in the lowlands of western Washington. These adorable 2 to 3-inch-long fish are Washington State’s only endemic fish, meaning this species is found nowhere else in the world! A portion of the population lives in Olympia’s own Green Cove Creek watershed, an area of conservation focus for Capitol Land Trust. The Olympic mudminnow was first scientifically described by John Schulz in 1929, after a Grays Harbor County Game Warden, John H. Winslow, discovered the unknown fish in a small ditch near Satsop, Washington. Not much was known about them until the late 60’s and early 70’s when two students from the University of Washington focused their graduate research on the Olympic mudminnow. While there are five species of fish we call mudminnow, the Olympic mudminnow is as closely related to pike and pickerel than they are even to some other mudminnow species. During the breeding season they display beautiful iridescent colors but other times of the year are often drab olive-green color. Olympic mudminnows are resilient little fish, able to withstand low dissolved oxygen and a wide range of water temperatures. This may help them to survive conditions in marshy wetland habitats that other fish may not be able to endure. They generally require freshwater habitats with little to no flow, muddy substrates, and abundant aquatic vegetation, making wetlands around Green Cove Creek an ideal environment. Green Cove Creek sits between the Evergreen State College to the west, and Olympia’s urban growth boundary to the east. The creek drains an area of 2,600 acres and empties directly into Eld Inlet. The watershed has seen rapid land development over the years, causing altered hydrology of the watershed and loss of wetland habitat. Due to the rapid changes in availability of wetland habitat due to development and the fishes limited range, the Olympic mudminnow was listed as a State Sensitive Species in 1999, meaning this species is vulnerable or in danger of decline without active conservation. Starting in the early 2000’s, Capitol Land Trust, the City of Olympia, Thurston County, and local citizens prioritized conservation of the Green Cove Creek watershed, resulting in the conservation of nearly 200 acres and 9,000 feet of Green Cove Creek shoreline. Since the discovery of the fish in the early 1900’s, research interest in Olympic mudminnow as waxed and waned. 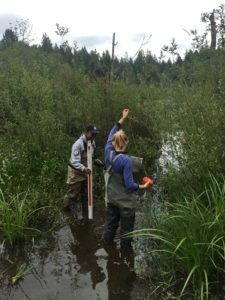 A population is currently being studied in the Green Cove Creek watershed by the US Fish and Wildlife Service (USFWS) and the University of Washington. 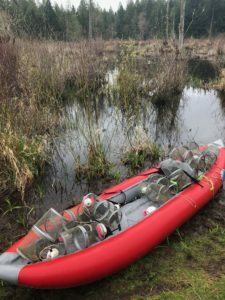 Scientists at USFWS and the University of Washington have been sampling Olympic mudminnows in the Overhulse wetlands, a portion of which is protected by CLT. This area was selected after the Washington Department of Fish and Wildlife compiled all known distribution data of the Olympic mudminnow and highlighted this area as a gap in survey data. The goal of the year-long study is to determine the best methods to use when sampling for mudminnow. For example, should traps be set overnight or will short (daytime) sets work just as well? Are fish active in winter, or should sampling only be done in summer months? The answers to these and other similar questions will help the researchers not only find new populations of Olympic mudminnow in the future, but also evaluate data from older survey records. To conduct the regular monthly sampling, AmeriCorps Conservation Scientists Carlisha and Olivia begin by setting out 30 bait traps. Creatures enter the trap and are not able to exit. 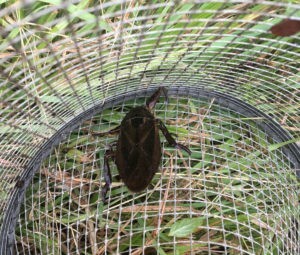 The following morning, they collect each trap recording all species found and taking other measurements like temperature and vegetation cover. 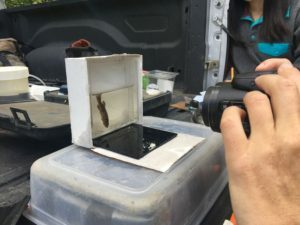 Olympic mudminnow are weighed, measured, and photographed to detect changes in body condition and spawning readiness over time. By monitoring this population, they can detect data differences between seasonal changes in the wetland and changes in the mudminnow population over time. 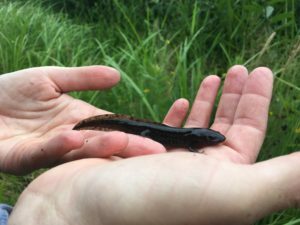 In the most recent bait trap sampling in CLT’s Ekar-Overhulse Preserve, we found Olympic mudminnows as well as Northwestern salamanders, rough-skinned newts, and assassin beetles. 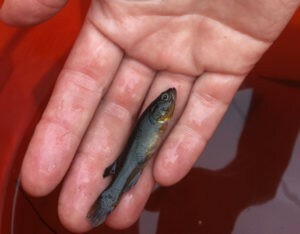 UW’s Freshwater Ecology and Conservation Lab and US Fish and Wildlife Service are planning a public workshop for this fall to communicate recent research and status of this fascinating fish; to request an announcement for the workshop or if you are simply interested in Olympic mudminnow, you can email Lauren Kuehne at lkuehne@uw.edu.